It shouldn’t be that much of a shock to learn that Spring Break is not just an American rite of passage; it’s become an institution, a brand in its own right. What may have started as a fun way to hang out with your friends on your spring week off, evolved into the biggest student event of the year, and we mean that in every big sense of the word. By the early 2000s, nearly 40 percent of college students were setting out to travel for Spring Break, spending “nearly $1 billion” in Florida alone. That 40 percent number translates to roughly two million students. And, by the way, that number is steadily growing. One wouldn’t think that Florida’s northwest panhandle would be much to sniff at. After all, when people think Florida, they usually think mid to south Florida, as in Daytona, Orlando (home of Disney), Tampa, the Florida Keys, and of course, Miami. Panama City Beach, Florida? Who would have thought? Sitting on the Gulf of Mexico, the “Spring Break Capital of the World” draws up to 500,000 college students each year, and for years it was home base for MTV’s Spring Break coverage. So why does everyone come here? Quite simply put, Panama City Beach is the “Beach Within Reach.” Its northern location makes it very accessible and easily traveled to by students hailing from anywhere east of the Mississippi not wanting long flights or full day long car journeys. It also helps that Panama City Beach has some of the best and biggest nightlife scenes around, featuring several massive beach-side clubs, including Club Lavela – “the largest club in the USA”. Spinnaker Beach Club, Harpoon Harry’s and Sharky’s Beach Club are also very popular draws for students. If you’re a student eager to have a blast this coming Spring Break 2016, it really shouldn’t take much convincing as to where you should go in March. 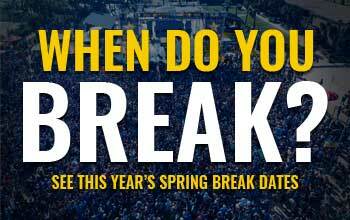 But just in case you’re still on the fence, we hope you’ll continue to visit the world’s number one Spring Break website pcbeachspringbreak.com for all the upcoming news and updates as they arrive. See you on the beach in 2016!